Prejudiced projection in cartography—and particularly in pictorial mapmaking—may go back as far as the Aztecs or the Europeans, who drew North America and Africa as tiny slivers on the mapamundi in early atlases. It is they, perhaps, who led the way for the type of tongue-in-cheek mapping that became popular during the golden age of pictorials, with the work of Daniel K. Wallingford (famous for his satirical map “A New Yorker’s Idea of the United States of America”) at the movement’s helm. In 1976, Sol Steinberg put the genre back in the public consciousness with his New Yorker cover map “View of the World from 9th Avenue,” which demonstrates the idea that New Yorkers believe the world begins and ends at the boundaries of the five boroughs. Lesser known but just as clever is E. Dudley Chase’s version (click to see the image larger), which here shows the attitude of Californians in 1940. 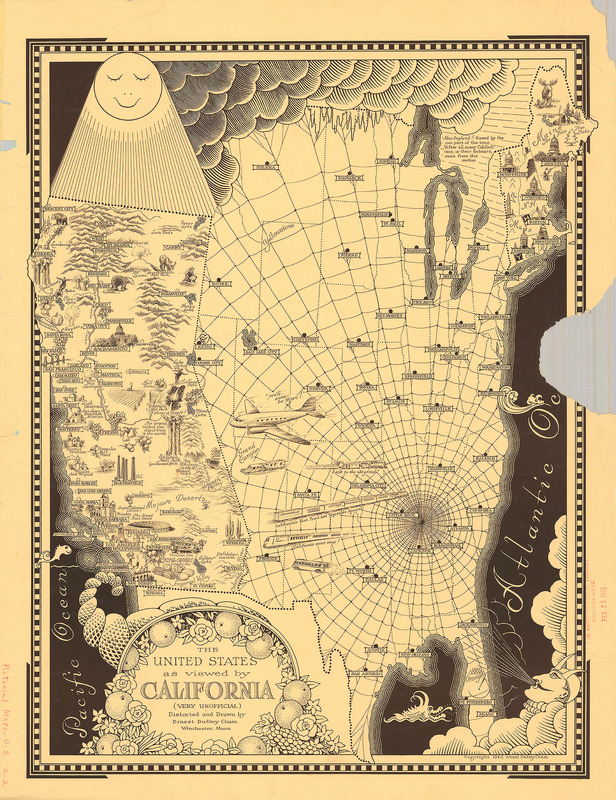 The golden state spreads far and wide beneath sweet sunshine flowing from the top of the map while the rest of the country is trapped under a gloomy web of semi-darkness. Of course, the state hovers directly above a cornucopia overflowing with grapes, oranges and roses. The “fly-over” states are just an afterthought with odd inclusions being Hibbing, Minnesota, Lansing, Michigan and Buffalo, New York mixed in with the state capitols. Chase, one of the true greats of pictorial mapping, used a pixel technique in which he created incredibly detailed looks at parts of the U.S. and world dot by dot. And his maps are masterpieces of the form. 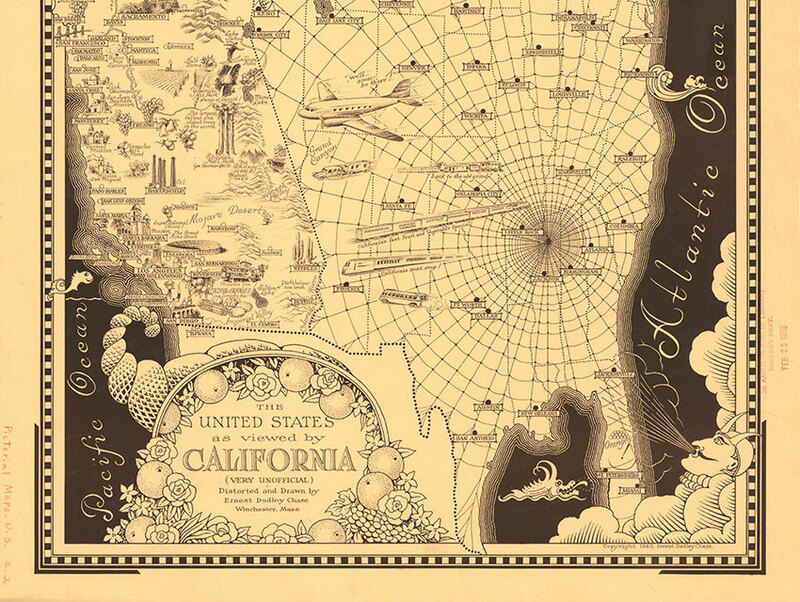 Amazingly enough, he didn’t even start creating maps until he was 49 years old, and while they are full of whimsy, they are also geographically meticulous and brimming with historical fact. On this map, one might notice New England getting some respect while Maine, Vermont, New Hampshire and Massachusetts dwarf big cities like Philadelphia. It is also delightful to see that the great New York City is no more important on the map than Needles, El Centro and Blythe. The irony of the map is that E. Dudley Chase was a mapmaking enigma, a true-blue New Englander and businessman who used his graphic arts skills to build up and sell the work of a successful greeting card company (Rust Craft) that eventually made him their vice-president. This position allowed him to travel extensively and create 50 truly memorable pictorial maps. His first love may have been high quality greeting cards (and indeed he wrote a book on the history of cards in 1926 that is still a standard text on the subject), but it seems as though his passion was cartography.